The last two sections from the Passes tab in 2D Contour machining are Smoothing and Feed Optimization. 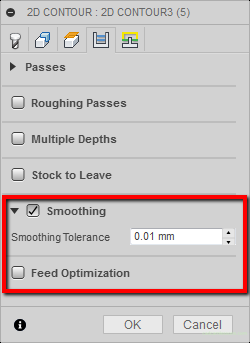 By selecting the Smoothing option, we let the Fusion 360 smooth the toolpath a bit. In places where it will be possible, he will remove points and approximate the path with the given tolerance. This can help to reduce the code line and reduce the machining program. What’s more, the machine itself will be able to work faster and more smoothly. When machining complex shapes, it is divided into short sections. Then the machining program is very long, and some machines can not handle it and the machining could be look as if step by step machining. Using the Smoothing option, the CAM system will try to change these short sections to one line or tangent arcs. This approximation will be with a given tolerance, and the deviation from the standard shape will not be greater than the sum of tolerances from the Tolerance field in the Passes section and from the Smoothing Tolerance field in the Smoothing section. In this case, the maximum deviation from the reference shape should not be greater than 0.02 mm. 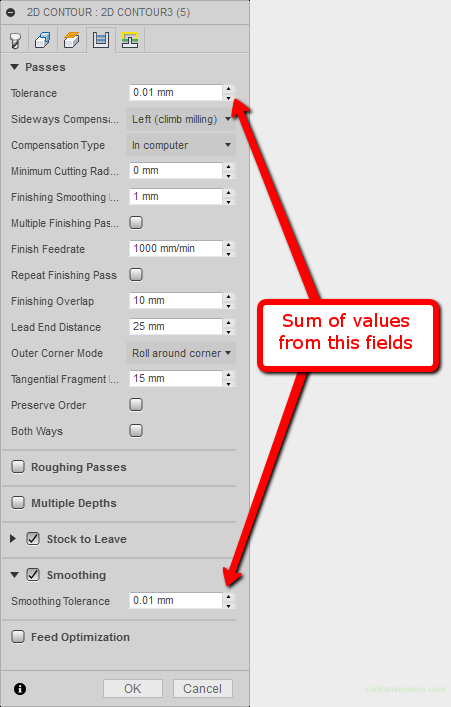 Of course, in the case of simple 2.5D machining, where we machine relatively regular shapes, this option doesn’t apply much. It can be helpful when we load a geometry (even 2D) from a graphic program in the form of a spline. For many of the machines present on the machine market, the size of the machining program is no longer important, because they are equipped with quite large disks. Although there are still such ones with limited memory. But the larger number of short segments in the g-code could be a problem problem. So, in this case Smoothing could help a little.